The only TRUE 12v mobile welfare unit available in the UK. Primarily powered by solar panels and batteries, CO2 emissions are reduced by up to 80% (compared to a standard 240v generator run cabin) and you could save up to £150 a week in diesel costs alone. Backed up by a bespoke build 12v automatic super silent generator which stops and starts when required. A mobile welfare unit is easily towed to position and secured against theft, which not only meets all welfare regulations but also saves you money and reduces your carbon footprint. Easy to set up and remove from site with just one person in under 2 minutes. Hydralically controlled to transform from a versatile mobile unit into a secure static unit effortlessly. Operated from a safe position at the touch of a button with our long reach remote control. Once in position you are left with a safe, secure static welfare unit. Small and light enought to manovour into any position either onsite, by the rail track or on a public highway. WC room complete with chemical toilet, regulation forearm sink with hot runing water, air freshener, 12v led PIR lighting and toilet roll dispenser. Spacious canteen area, units available for 6 or 10 people. Anti vandal security doors and locks alround. Comfortable spacious canteen table and seating area. Meets all your welfare and CDM requirements on site* A warm dry place to eat. * facilities to wash.* Facilities to hang and dry wet clothing. *WC facilities. PIR light sensors for greater efficency and CO2 detectors for safety. Easy to use control panel with pre programable timer settings and 24 hour use settings, led fault warning lights and trip switches. A never before seen instant hot water system, which means you can make a cup of tea at the push of a button. Responding to today’s rising fuel prices and environmental concerns the JCB Eco Welfare Unit has class-leading efficiency and low running costs. Main power source from the latest solar panel technology providing clean energy, helping you meet your environmental targets as well as saving money. Bespoke built pure 12v super silent generator. 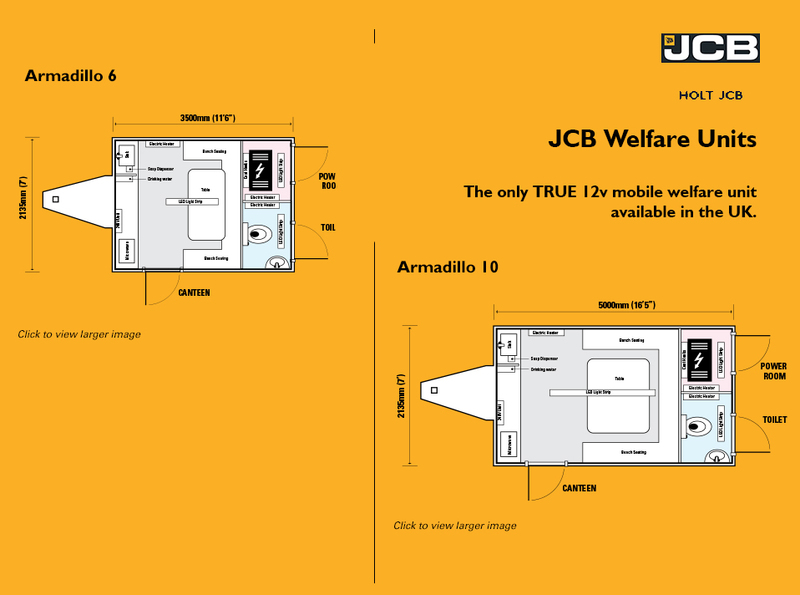 You can download the Welfare Unit brochure here. For further information please contact your local salesman or complete the sales enquiry form and one of our sales team will contact you back.